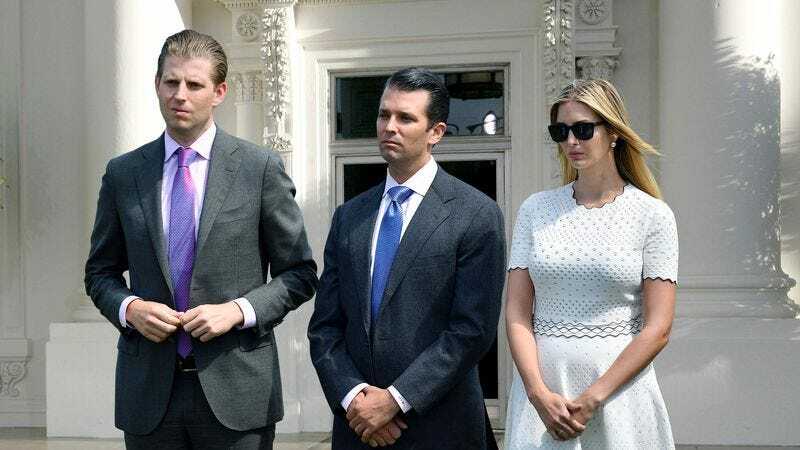 WASHINGTON—Bringing a conclusion to decades of contentious court proceedings, Donald Jr., Ivanka, and Eric Trump were reportedly removed from the White House on Thursday after their mother, Ivana Trump, won her 25-year custody fight for the children. “We’re happy with the judge’s ruling that Ivanka, Don, and Eric’s father is unfit to look after these children, and that their best interests are served by having them live with their mother full-time, effective immediately,” said Aaron Franz, an attorney for Mrs. Trump, who reportedly arrived with his client at the North Portico of the White House early this morning to rouse the children from their beds and shepherd them, along with a few bags of their possessions, into a waiting minivan. “After years of fighting tooth and nail to be granted guardianship, we’re relieved to finally get these children out of such a hostile and unhealthy environment and into the loving care of their mom.” Franz added that leading a life removed from their father’s domineering influence would give these kids a real chance at someday becoming well-adjusted, productive members of society.